Naini Lake is a natural freshwater lake, of tectonic origin, located amidst Nainital city of Uttarakhand. It is lunar-shaped and has an outlet at the southeastern end. Naini Lake is one of the four lakes in Kumaon hills, the three other being Sattal Lake, Bhimtal Lake and Naukuchiyatal Lake. Balia Nala is the main feeder-stream of the lake. Other than this, 26 major drains, including the three perennial ones, feed it.Increasing population, unplanned growth of human settlements and tourists together appear to have taken a toll of the beautiful lake that gives the hill resort of Nainital its name. 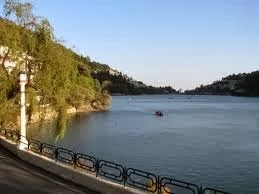 According to a recent study conducted by D K Pandey of the Dehradun-based Forest Research Institute, the water quality of the Naini lake has been steadily deteriorating and is highly polluted due to the addition of exogenous wastes, as a result of more than 37 per cent increase in human population in the catchment area of the lake and too many tourists. Also, high siltation resulting in reduction of lake depth, the depth of lake have reduced from its original depth of 29 m in 1871 to only 13m in 2007.